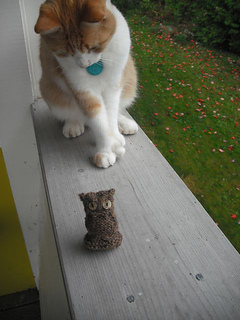 There have been owl-cable sweaters, hats, mitts and mittens. Now, what the world has been waiting for, the owl-cable owl. It begins with a Turkish cast-on, ends with a Kitchener stitch and has some cabling in between. Judy’s Magic Cast on will also work. It’s a quick, sculptural knit and all the shaping is done by the cabling. 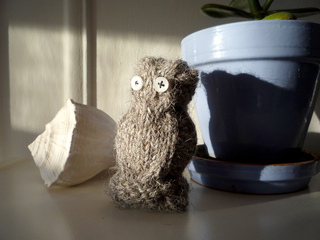 The owl may be knitted in any weight yarn to produce any size you might require; just be sure to use a smaller-than-recommended needle in order to keep the knitting tight enough to hold in the stuffing.